Byre Cottage sits two miles from the north Cornish coastline's beautiful coves and beaches. Surrounded by green landscape views and with so many adventures to be had at the oceanside or in the country, families and friends will enjoy this rustic and comfortable barn conversion bolthole. The small fishing port and beach at Portreath with narrow harbour is reached within minutes by car. The big stretch of sand make this a popular spot for swimming and surfing, under the watchful eye of seasonal lifeguards. Seek refreshment at the town's café, pub or restaurant or get active along the South West Coastal Footpath - an advantageous spot to spy the striking cliff face and rock formation vista. Adjacent to Portreath is Illogan Woods, ideal for a gentle circular ramble to the 14th Century church tower. Follow the nature trails on cycle or foot around the ponds and lake at Tehidy Country Park with 250 acres of wonderful woodlands, or tee off at the golf club. 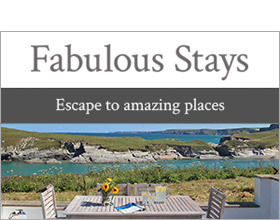 Explore the beaches and coves as you head up the coastline; Porthtowan, Trevaunance Cove at St Agnes, Perranporth and Newquay are all within easy reach with beach bars, cafes and inns for well deserved cream teas, award winning ales and nibbles beside the Atlantic. Take to the ocean with one of the surf schools and get board savvy - for both beginner and experienced white-water riders. Head west from Portreath and St Ives and Land's End beckon. These iconic destinations are stunning. Peruse St Ives with four gorgeous beaches, pretty harbour, galleries and gift shops. Dramatic Land's End guarantees amazing seascapes and rugged cliffs, with attractions come sunshine or rain. Byre Cottage is a charming and homely barn conversion set amidst big country views on a working farm. Alongside two other holiday homes (The Loft and Trotters), the accommodation is all on ground level with an open-plan living room and dining area - perfect for gatherings - to the well equipped kitchen. The shared enclosed garden has a raised lawn and patio, a sunspot for pets and children to play safely, and picnic lunches in the Cornish air. All on ground floor. Two bedrooms: 1 x king size double with en-suite shower, basin and WC, 1 x twin. Bathroom with bath, low level shower over, basin and WC. Open plan living room with kitchen, dining area and sitting area. Beach, shop and pub 2 miles.